Diffusion ordered NMR spectroscopy or DOSY NMR, invented by Morris & Johnson in 1992 (DOI DOI), is a 2D-NMR technique displaying regular chemical shift in one dimension and diffusion behaviour in the other. In this way each signal is enhanced with information about the size and even molar mass of the molecule under scrutiny. In recent times DOSY has been used to study host-guest chemistry with cyclodextrin(DOI), the detection of biotoxins for the military (DOI), the molar mass distribution in block copolymers contaminated with homopolymer (DOI), the analysis of nanotubes (DOI), all the way to the detection of counterfeit sildenafil pills (DOI). Garcia-Alvarez et al. have applied DOSY NMR to turbo Grignards. In 2008 this group found LiClMgCl rings in the solid state structure of (TMP)MgCl.LiCl (turbo-TMP, see earlier blog). In their latest work (DOI) they mixed Lithium diisopropylamide and magnesium chloride in THF. The solid state structure of the resulting crystals is an assembly of centrosymmetric dimers, again with the LiClMgCl motif. This structure was ruled out in the THF solution phase because a species with that molecular weight could not be found. 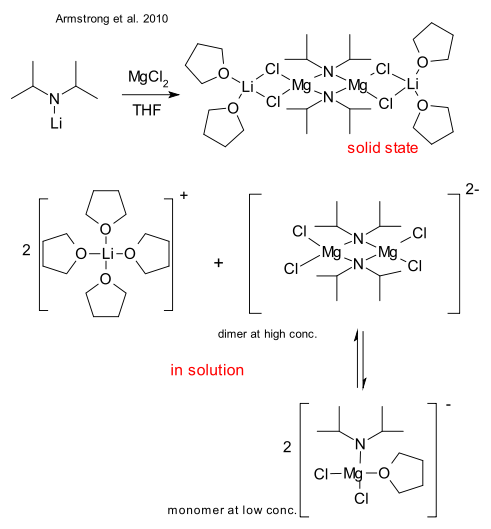 Instead DOSY supported the formation of solvent-separated ion pair with a completely THF solvatated lithium ion complemented with a dimer dianion and a monomer anion in equilibrium.